Massachusetts state university presidents take the It's On Us pledge, declaring that there is no place for sexual violence in our state universities. Protecting students, faculty, staff, and visitors from any violence that they may encounter—whether from a stranger with a gun, or from a peer at a party—is foundational and essential if we expect a campus community to thrive and succeed in an academic environment. Recognizing this, in January 2016, the Massachusetts Commissioner of Higher Education assembled a Campus Safety and Violence Prevention Task Force that included higher education Presidents, Campus Police Chiefs, Title IX Coordinators, and student leaders; representatives of the Commonwealth’s executive branch and agencies; and community-based practitioners. Securing Our Future: Best Practice Recommendations for Campus Safety and Violence Prevention. The report encompasses more than a series of recommendations related to campus safety and violence prevention, with a focus on active shooter and sexual violence risks. By building off of prior studies, work done across the campuses, national best practices, and emerging research, its overall theme is to focus on practical, fair, and transparent ways to protect our campus communities, especially the Commonwealth’s 29 public institutions, from an array of harms. Attorney General Maura Healey spoke at the Statewide Campus Safety Conference in Worcester, Mass. on September 28, 2016. In September 2016, the Department of Higher Education, in partnership with the Massachusetts Attorney General’s Office and the Executive Office of Public Safety and Security, held a statewide conference to follow up the report. 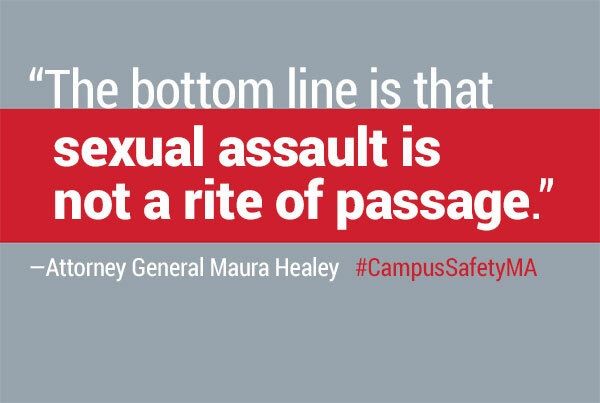 offer trainings and resources to administrators, campus police officers and Title IX coordinators, in the area of campus safety, including and especially campus sexual violence and active shooter incidents. Go to the 2016 Campus Safety Violence and Prevention Conference page for an overview of the event and downloadable materials.